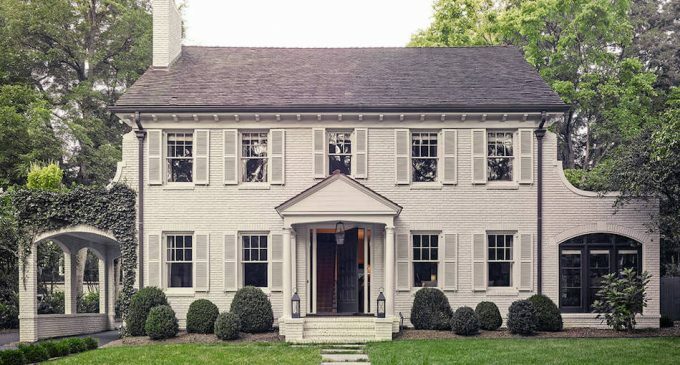 A classic Georgian home on one of Charlotte’s most sought-after streets has been completely reimagined by architectural firm Pursley Dixon Architecture alongside interior designer, Heather Smith of Circa Interiors and builder, Salins Group Inc. The 3,658 square foot home was built in 1950 and last sold in October 2011 for $930,000. Pursley Dixon Architecture describes the reimagination as blurring the lines between traditional and modernity. The light-coloured original structure flows seamlessly with the airy additions to the rear of the home. A large living porch provides a comfortable backdrop for dinner and fireside chats. A bridge to the master bedroom creates a three storey ‘slot’ connecting the upper levels of the home with a subterranean media lounge below. Zillow currently zestimate’s the value at $3,135,000. Photography by Chris Edwards. Scroll down and a take a tour inside!